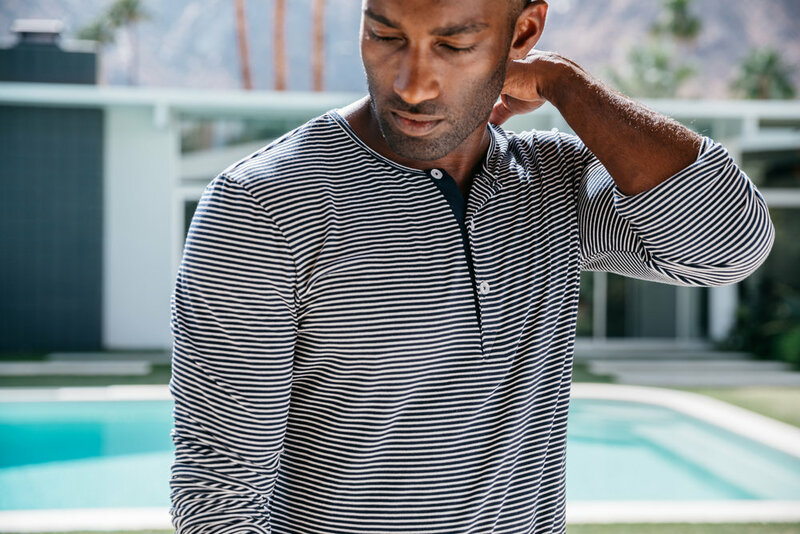 Mizzen and Main Capp Pullover available here. Mizzen and Main can be found at both or our locations in downtown Baltimore and in Hunt Valley - Cockeysville. Spring is right around the corner and we are introducing three nice layering pieces that you can start wearing right away. Two versatile henleys in black or grey and a light blue pullover. When the weather is transitioning, shirts like these can help keep you comfortable in the yo-yo weather we can soon expect. QG brought Mizzen and Main aboard for its performance fabrics that have four way stretch, are breathable and are wrinkle free. We do recommend for best performance to hang dry. You may have tried Mizzen and Main dress shirts, so if you have you’ll find these to be even softer and even more comfortable. Check out each of these looks in our online store: Knott or Crawford Henley and Newman or Capp Pullover. Please stop in to either of our locations to try on or while you are in for an appointment or having a bite or drink at Clock.